Here is a little preview of a project Lauterborn Electric has been working on in the Graduate Hospital section of the city of Philadelphia. 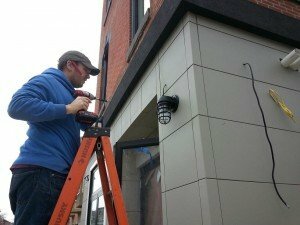 The images show some finish work being done by one of Lauterborn Electric’s finest, Ryan Lauterborn. He is hanging one of the many outside light fixtures installed on the project to help illuminate the outside of the property at night. The lights were supplied by the customer who ordered a brand called Barn Light. 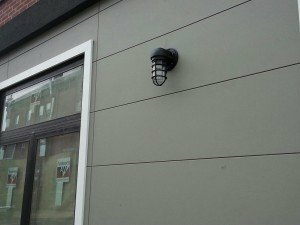 All the outside fixtures are controlled by a timer which can be set to go on and off at the customer’s convenience. Stay tuned for an article about the total finish of the Christian Street project. 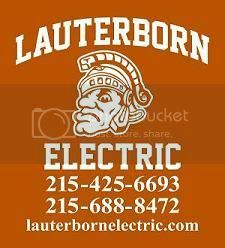 For all your electrical needs, contact your Licensed Philadelphia Electrician, Lauterborn Electric.